“What would it take to convince you that the woods you just left is a hundred and forty-four years distant from the one you entered? 1) I once toured the Custer Sharp House, headquarters of the Londonderry Vermont Historical Society, and studied photographs there that were taken just after the turn of the twentieth century. Looking over pictures of the area around Londonderry and Weston I was surprised to see that the mountains were nearly treeless—they were crisscrossed with stone walls, covered with sheep pastures. Within the period between the Civil War and WWI, Vermont’s mountains were about 85% cleared of trees. Today, the Green Mountains of Vermont are covered with forests, though you’ll not find but a handful of trees that are over a hundred years old. The trees of modern day Vermont are very young compared to those my main character, John Bartley would have known. This is the first thing John notices when he slips from his time, into 2009. 2) During John’s time period, it was common for families to have ten or more children—free farm laborers, I imagine. The few families I describe in my story are scaled down because I didn’t want to overwhelm my readers with a bunch of names. 3) I first learned of the village of Greendale (the setting for my story) from an old-timer in Londonderry. I was intrigued by his account and immediately went off to explore its ruins. I found it just as I describe it in the story. I lived in Vermont for seven years, three of which were at the base of Greendale Road. I used to hike up to the ruins from time to time, and find fragments of dishes. I also found evidence of a mill among the old, dilapidated, stone foundations. There’s still a mystery as to what actually happened to the village. I could not find an answer. The account I give in my story of Abby Hemenway, the Vermont historian, is also accurate. The only recorded history of Greendale that may have existed (that I’m aware of) was destroyed in a fire before it could be published. 4) The most common form of recreation and entertainment in 1875 Vermont were the barn dances. Everyone participated. Second to that came poetry. Nearly everyone who was literate at the time dabbled in poetry and openly shared it. I did a lot of searching through period poems and letters looking for clues about dialect and collecting interesting nineteenth century colloquialisms. 5) One day I was having breakfast at a restaurant on Grand Isle. Someone had left a copy of The Islander (a small, Vermont newspaper) lying on the table I sat at. On the front page was an article about two early Vermont inventors, Orange Smalley and Thomas Davenport of Forestdale, VT, who, in 1837, collaborated on experiments with electromagnetism that eventually resulted in the patent of the electric motor by Davenport. I grew up believing that people didn’t start monkeying with electricity until the later part of the century. So, yes, I thought this was interesting. 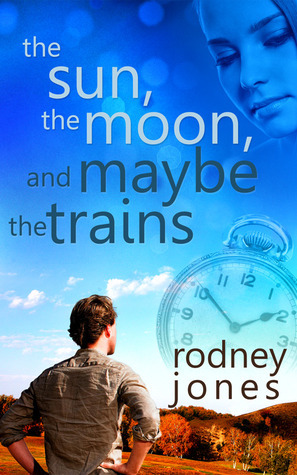 For more about The Sun, the Moon and Maybe the Trains check out these sites! The facts are pretty cool, I admit. I love that the author actually bothered to thoroughly research the setting of the book. Whenever authors just recreate the world from their imaginations when it's a real location, it drives me insane when they're not accurate. Definitely going to check this one out. Sounds similar to Tempest by Julie Cross.